Chronicle Collectibles has opened up pre-orders for their upcoming Jurassic World – Indominous Rex 1/24 Scale Statue. This statue made its debut over the summer during San Diego Comic-Con 2017. This statue stands at 12″ tall, but is a massive 30″ from head-to-tail. The statue is based on the hybrid dinosaur seen in the film. The Indominous Rex stands atop a themed base, featuring a Jurassic World logo plaque. It’s scheduled to ship out in the third quarter of 2018. The statue is priced at $750. You can pre-order it Here. Read on for all of the photos. Ten successful years have passed since Jurassic World was renamed and reopened to the public. InGen’s owner, Masrani Global Corporation, is overjoyed with the opulence of the park and continues to pressure the InGen scientists to push for bigger and better attractions. After seeing a decline in profits, Simon Masrani pressures the park’s chief scientist, Dr. Henry Wu, to craft a new dinosaur by splicing DNA from multiple dinosaurs and other animals. Unbeknownst to Masrani, Wu already had plans to weaponize his spliced creations for military operations. When scientists in the real world or a fictitious one create new weapons, the key is packing the most punch with the resources available to them. The Indominus Rex is no different. Some of the known species that were used by Dr. Wu in the creation of the hybrid dinosaur are Tyrannosaurus rex, Velociraptor, Carnotaurus, Giganotosaurus, Majungasaurus, Rugops, and Therizinosaurus as well as modern animals like cuttlefish, tree frogs, and a pit viper snake. The mixed DNA of these creatures birthed a dinosaur so strong and intelligent that she escapes from her pen by controlling her body temperature to fool the thermal cameras, tricking the staff into thinking she had already escaped. Just before all hope was lost for Jurassic World, an unlikely adversary appears to contain the rampant Indominus Rex, giving audiences one of the most epic battles in the Jurassic Franchise. The Indominus Rex is the first of two installments of this Final Battle. The second segment will be available for pre-order at a later date. The bases will align to create the diorama of the battle scene, or the two products can be displayed separately in the dynamic poses designed by Glen McIntosh from Industrial Light and Magic. Glen was the Animation Supervisor responsible for the Indominus Rex on Jurassic World and has been instrumental in bringing this diorama to life. The Indominus Rex is roughly 30″ long and 12″ tall on her own, so put together the entire diorama will be about five feet long. Fans of classics SEGA video games should remember the Space Harrier franchise well. Space Harrier helped to kick off the early “on-rails” shooter genre, where you moved in a pre-determined direction and blasted everything in your way. Space Harrier itself is relegated to the obscure 80’s relics pile these days, so seeing official product for it is very rare. RC Berg, Ltd is going to give fans of the classic game a chance at a few cool collectibles. 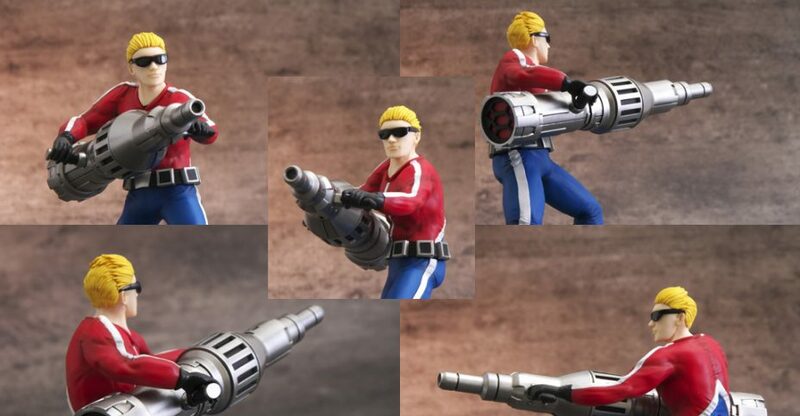 They have announced two Space Harrier 3D – Scaled Resin Model Kits. They are releasing a 1/12 scale Harrier, the protagonist from the game as well as the mysterious IDA, the stone faced enemies from the game. IDA will be 1/24 scale. The hero, Harrier will include two bonus accessories. These include a smaller Harrier figure, which is roughly the same scale as the Ida model kit. You will also get a second hair sculpt. The alternate hair is meant to match the Space Harrier’s arcade poster. Harrier requires assemble, but is pre-painted. IDA requires very little assemble. That kit can function not only as a scaled enemy for Harrier, but also as a pen/pencil cup. IDA includes a small sitting Harrier. Pre-orders for these are live now and run until June 25th, with a release scheduled for July. Harrier is priced at 10,584 Yen with tax included (about $96 USD). IDA is priced at 9,720 Yen with tax included (about $88 USD). Check out the photos by reading on.